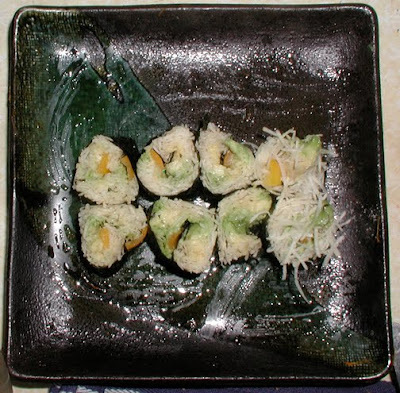 One of my favorite dishes is a maki roll like you get in a sushi bar. I can't eat rice, so I have experimented over the years with trying to get a rice substitute for a roll. I tried sprouted grains mixed with avocado, and various mushed up sprouted grains, which did not work at all. I tried then grated roots and veggies, like zucchini, which were also disasters. The key is that you need to grate up something very fine that is also on the dry side. 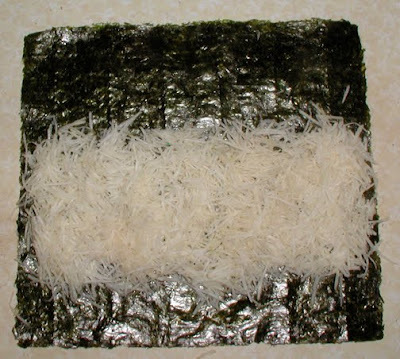 Anything wet will make the nori sheets fall apart when you try to roll and cut the roll. Vegetables that work well are sweet potatoes/yams, and roots of the umbel family like carrots, parsnips and celeriac. I stopped using sweet potatoes because raw, they do have enzyme inhibitors although I find them fairly easy to digest. I do not eat dandelion roots or sunchokes because I find them hard to digest. You can mix some roots in with celeriac like a bit of radish if you want some punch, but radishes by themselves are too wet. Some winter squashes are dry enough, but often taste awful raw. 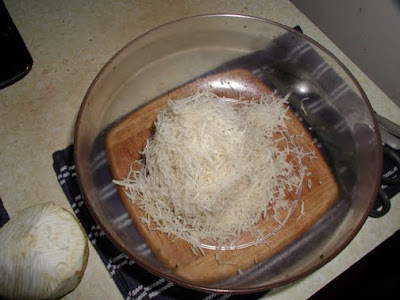 Here I have grated up some celeriac. Celeriac, or celery root, wins the contest as the ugliest veggie out there. Like celery, it's grown in mud and has roots all over it. It's also a veggie that you have to eat organic or grow yourself. It likes a lot of water, but is less sensitive than celery. If you cannot get it in the stores, use parsnips (like a white carrot or large radish) or even those old cooking carrots (the new ones are too juicy.) 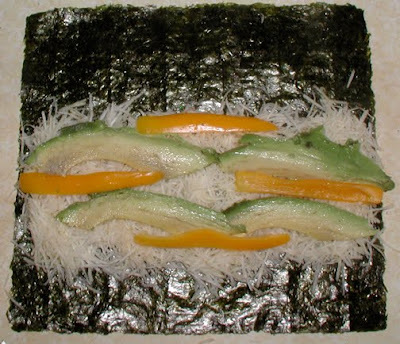 If you want to eat sushi (raw fish) I recommend using green papaya instead of roots; it will digest better. The trick to a roll is not to use too much on it. Only cover half the sheet with celeriac, only about a 1/4 of an inch deep (less than a cm.) The finer you can grate your roots the better. Put on some veggies. Try not to overdo it. I like avocado. Avocado is good with sweet peppers as you see here, or cucumbers. Do anything you can think of, get creative. I also like marinated shitake mushrooms (don't use most mushrooms raw). If you like, you can even use raw sushi-grade fish, but it's harder to digest with the carbs in the celeriac. You could also try a fruit maki roll, but be aware that anything too wet will wreck the roll. It may take you a couple of times to get the hang of rolling the nori sheet. You must roll it as tight as you can. Have some water ready to wet about 1/2 an inch of the last of the sheet (at the top) so that you can seal the roll. The seaweed will stick to itself if you wet the sheet. Don't get it too wet and hold the roll over the seam for a minute, pressing it down onto your board. To cut the roll demands a very sharp, clean knife. Clean the knife between cuts. Nori sheets have perforate guides on them, but it's easier to cut the roll once through the middle and then double it up and cut two at a time, into quarters and then into eights. Watch the sushi chefs do it. The ends of the roll will be a little messy like in the picture. You can fuss with it if you like. Also experiment with sauces to go over the roll or to dip the roll in. You can sprinkle black sesame on top for an authentic look. Using colored radish or a bit of carrot makes the roll very colorful. This is great fun with kids. Enjoy!